The Kamasan B940 Aberdeen Short Shank is another great all-rounder. A very popular Aberdeen hook as it is good value for money and useful from boat or shore for so many different species. The high carbon steel wire gives it excellent strength and the black coating hides it well from wary fish. Needle sharp point for a quick, clean hook set. The short shank variety is best for small baits such as crab, mussel and small worms. The size of your hook needs to be appropriate to the size of your bait but with a short shank hook and small bait, once rigged onto the hook the bait is less likely to slide down the shank and conceal the hook point. 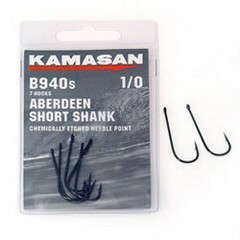 FREE Delivery on all Kamasan Sea Fishing Hooks over £100!! !